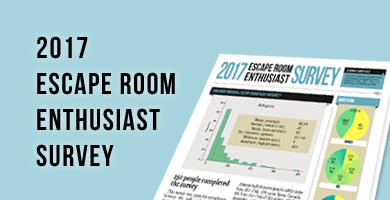 In August, 2016, the Room Escape Divas had a podcast with Donald Dennis about board games from an escape room perspective. However, there were a few we did not cover that are marketed as “escape room board games”. 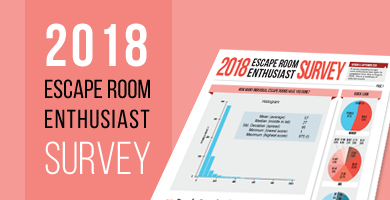 This post will list escape room board games as well as their reviews from Escape Room blogs, but does not include reviews from board game blogs (since there are a number of them). Furthermore, this will be updated as necessary, so if I have missed board games or reviews from escape room blogs, please tell me! The following games can be purchased from board games stores and usually put out by a publisher. Click the image for access to its BGG entry. In Deckscape: Test Time, you have been selected from Doctor Thyme’s most brilliant students for a special project. He’ll test your skills, and if you succeed, you’ll get a unique chance to help him on his newest and greatest invention. While he’s explaining his project, he distractedly pushes a button: an alarm cries loudly and heavy gratings shut all the windows and the exit door. The laboratory is locked! Doc Thyme falls through a trapdoor below his feet and the lights turn off. Will you be able to pass Doctor Thyme’s exam and exit his laboratory? Using just sixty cards, you will take part in a hectic adventure, without leaving home. As an enthusiast who enjoys difficult and fair puzzles, I prefer this out of all the games listed here. 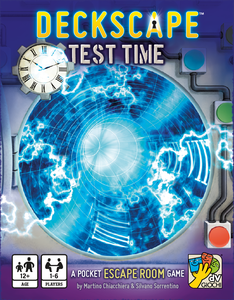 Deckscapes trusts the player not to cheat and doesn’t try to implement fiddly mechanisms to disourage it. The cards are larger than standard cards, and unlike Exit’s, I didn’t have to squint to find important information. And the puzzles were challenging enough that we had to pass them around to other players to get multiple viewpoints. Everyone had a chance to be involved. And you know what’s glorious? When you get an answer, for the most part, you will know it’s the right one! No arbitrary “Shall I try this card on this one? Who knows? Could work!” Because of the puzzles, mechanics, and the fair difficulty, I find this game far superior to the other two. Even though we lost, I enjoyed it immensely. You are trapped inside a small room; there is a locked door but you don’t know the code to ulnock it. This is a free print and play demo. This kickstarter game has been taken on by Mattel. In Escape Room In a Box: The Werewolf Experiment a group of two to six people has only one hour to work together in order to find clues, solve puzzles, and crack the codes that will unlock the antidote and keep them from turning into werewolves! …offered us a better experience than many rooms do, and it did so from the comfort of our own dinning room, at the price of 1.5 tickets to an average room escape. 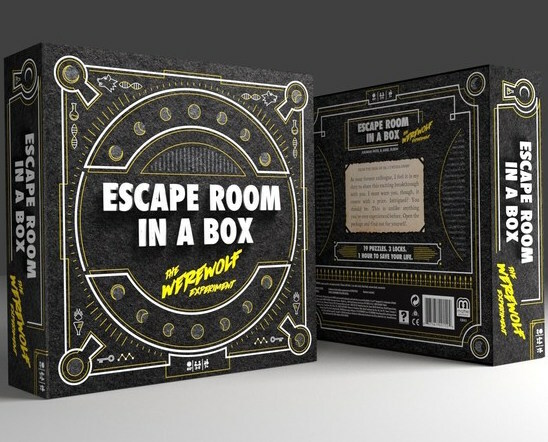 Escape Room In A Box: The Werewolf Experiment is a great game. It’s well-designed, innovative, and fun. Resettable: Yes! Items meant to be folded, written on, etc.have a small “printer” printed on it, meaning you can find this item on the website and print it. Can you keep your cool under pressure? Escape Room The Game from Spin Master brings the thrill and mystery of an escape room to your home. Work together to solve puzzles and find hidden clues to escape before time runs out! The Chrono Decoder counts down from 60 minutes and creates a real escape room atmosphere. Play 1 of 4 different escape room adventures with varying levels of difficulty: Prison Break, Virus, Nuclear Countdown, and Temple of the Aztec. You win or lose together with Escape Room The Game. The games are quite fun, except that the first one (Prison Break) has a particularly bad puzzle at the end — probably the worst puzzle in the whole 4-game box — which is sad because it puts people off the whole set which is otherwise pretty nifty. The materials are mostly paper/cardboard with an electronic timer/verifier/codesheet gadget. The gadget is cute enough and works OK, though it feels a little cheap. Hints are time-triggered and pretty well designed, but of course may or may not match what you need at any given moment. The stories are cliche (prison break, virus lab, etc) but capably told, the kit is good quality (for being paper and cardboard), and the illustration is well done. Recommend 2-4p max. Can be reset as long as you’re careful not to mangle anything. This wasn’t the most brilliantly designed game out there, but we all enjoyed our time puzzling together, and that ain’t nothing. One thing we’re also noticing with boardgames like these, is they are prone to bottlenecks. Meaning that at any one time you are likely to have 1 or 2 players working on a puzzle and the rest will be twiddling their thumbs. All-in-all we had a fun time (hiccups aside) honing our escape rooms skills. It definitely doesn’t replace the Live Escape Room experience, but a good take on an at-home version. Would we recommend this game? …possibly. It depends on who you’re playing with. …after finishing one of the stories we immediately wanted to do another one. Exactly, just like real escape rooms. 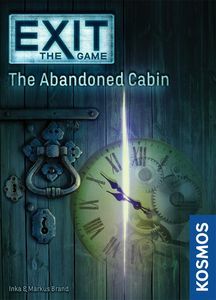 Exit-Game.info, a German escape room site, also has an unboxing video, as well as a review of one of the games, Prison Break. Escape Room Expansion Packs require Escape Room: The Game to play (sold separately). It’s a real murder mystery — the wealthy heir to one of England’s largest steel companies has been found murdered. Solve the case quickly or there’ll be blood on your hands! You and your team have 60 minutes to solve the crime, or the murderer will strike again. Can you solve the crime in time? I think that it’s a complete waste of money. Both expansions have original, fun puzzles that totally fit the theme and they feel balanced. 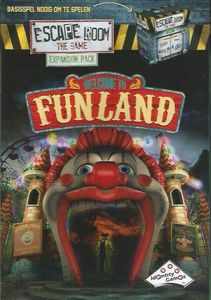 Escape Funland — an old amusement park of the edge of town that’s home to Happy Jack, a terrifying circus clown. You and your team have 60 minutes to free yourself from Happy Jack’s backstage cage and escape Funland. Can you get out in time? If you’re among the folks who truly enjoyed the original scenarios…it felt a lot like the original scenarios. I don’t think it’s a great value, but at $16 it won’t break the bank. These expansions are once again a nice and welcome addition to the original game. If we have to compare em to the original game and the other expansions Space Station and Murder Mystery are our favorites. Casino would end up more at the bottom, probably just below Funland. Probably the best ER-in-a-box out there right now (Oct 2016). All paper & cardboard, but fun paper & cardboard. Neat story, varied puzzles, nice illustrations. A bit lightweight for enthusiasts. Recommend 2-4p max. Can be reset & passed on if you’re careful. …you’re never going to get a fully immersive theme or a game with a lot of moving parts, but for under £20 you get a really fun set of puzzles that, in our case, engaged the four of us for 45 minutes. While the game might be a little bit too easy for escape room enthusiasts, it’s still a bunch of fun and great value for the price. We’d recommend the game for an hour of fun puzzles, especially to families looking for something to do with young children. The game flowed like an actual escape room where the puzzles lead from one to another seamlessly and were related to the theme. If you are interested in an at-home escape room game, this would be a great one to try! Highly recommended – though expect experienced players to solve the game faster than the stated time limits. …represents very good value for money, particularly since it can be repacked and passed on to other players, but as an experience it’s better for beginners, or perhaps as a warm-up for a group before a normal game. 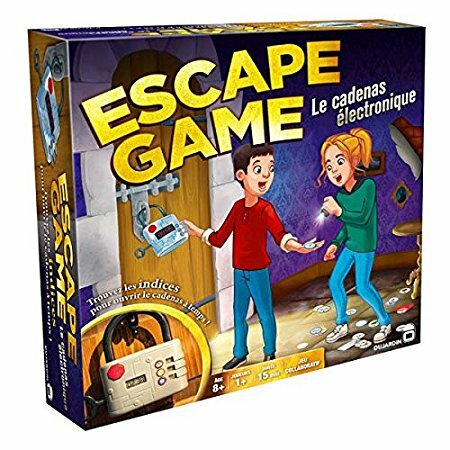 This is fun as an introduction or to play in between other games, but it doesn’t offer enough value for escape enthusiasts. If you finished this game, there is a spoiler laden podcast as the Room Escape Divas play through the game. Similar in style & presentation to Stargazer’s Manor. All paper & cardboard with some string. A bit less good than Stargazer’s — some bottlenecks in the middle and a puzzle genre that overstays its welcome, the story is a bit less engaging, the end a bit anticlimactic. Still a solid production. 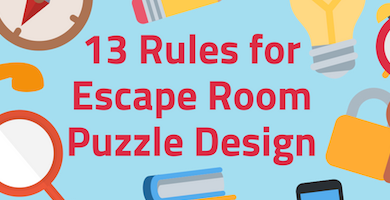 a must-play for escape room owners and designers because, as we’ve said before, if you cannot objectively blow away this game with your real live escape room, then you’re making a big mistake. 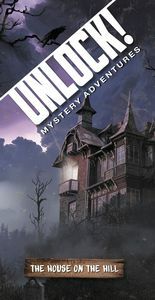 We enjoyed Secret of Dr. Gravely’s Retreat more than we did Mystery at the Stargazer’s Manor. The puzzles were more difficult and varied, players had more opportunities to get stuck, and the story was more satisfying. The main issue with this game … was the certain puzzles in this set can only be done by one person at a time, which everyone else watches and waits. This is fine for 2 people and maybe ok with 3 people, but will make playing with a group of 4 or more occasionally dull. In summary, I think it’s a half-hour of fun that’s worth the money but that will disappoint if you compare it to the first outing. I’d recommend playing with two or three people for the best experience. More than that will likely get frustrating. 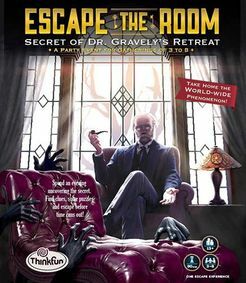 [Thinkfun] is consistently good, heavily story driven and literally everything we at Escape Authority look for in a physical game room, all right there in the comfort of your living room. …limitations aside, it’s much cheaper than a normal escape room, particularly since you can pack it up after playing and let friends try it too. Within the confines of the format it’s designed well, and there’s a decent amount to sink your teeth into. I’d rather do a physical room, but as a substitute it’s satisfying enough. Hebben we ons dan niet vermaakt? Jawel. Maar we hadden meer verwacht. Deels door de beloftes op de doos, deels door de escape rooms die we gespeeld hebben. Of misschien ligt het aan Escape Room The Game dat de lat een stuk hoger heeft gelegd. Dit is leuk als introductie of tussendoortje, maar biedt helaas net te weinig voor mensen die vaker escapen. After an unfortunate accident, you take shelter in an abandoned cabin deep within the forest. After an uneventful night, you wake to a locked door and barred windos. You discover a book and a strange turntable that might help you get out of this nightmare. satisfying puzzle games.… The Abandoned Cabin’s “strange items” were hyped up throughout the game… and oh my were they anti-climactic.… At a fraction of the cost of admission to an escape room, however, these boxes are a fun way to get your puzzle fix. The components are high quality and the mechanism works well. It’s difficult enough and has enough content to provide a decent challenge. The story is a fig-leaf, but it provides a solid sixty(ish) minutes of puzzle solving, with some original ideas. Enjoyable and loved the difficulty level. Better game flow than Pharaoh. We played with four and removed the staples from the paper booklet so each of us had things to do. Satisfying to solve the puzzles. …satisfying puzzle games.… At a fraction of the cost of admission to an escape room, however, these boxes are a fun way to get your puzzle fix. 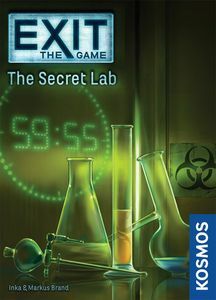 …the three Exit games share plenty of similarities and if you like one you’ll enjoy the others too; but if you were to buy only one, Secret Lab is my personal favourite of the three. The excursion to the Valley of the Kings is the highlight of your vacation to Egypt. As you crawl through the narrow passageways, you lose the rest of your tour group. You enter a mysterious burial chamber. A massive stone door closes behind you. On the floor lie a dusty notebook and an ancient disk. Game play suffers if more than two people. One paper booklet is needed for a multiple of puzzles, but only one person can look at this booklet at a time. We even removed the staples and it still didn’t help, so a couple people had to sit and do nothing. Furthermore, the main “Aha” puzzle, which could have been wonderful, was executed poorly. In the end, it was enjoyable but preferred Secret Lab in this series. 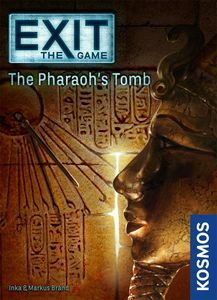 …satisfying puzzle games.… Lisa and I agreed that we liked The Pharaoh’s Tomb best.… At a fraction of the cost of admission to an escape room, however, these boxes are a fun way to get your puzzle fix. 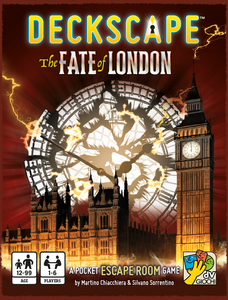 The game expands through multiple locations, illustrated attractively and well. It’s well-designed and at times ingenious, and is tough enough to provide at least an hour of solid entertainment, and quite possibly more. There are a lot of Exit games, but not available in English yet! 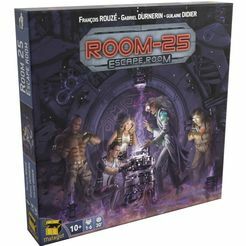 This is an expansion for the co-op board game Room 25. Currently, there are no reviews for this game. These or not available in English and no reviews are available for them. Some don’t have names so I kept a small description. Others look to be newer or adapted versions. It’s all confusing. Escape game geek – The planet is in danger! Soirée Escape Game – Lapins Crétins – Rabbits take you hostage! 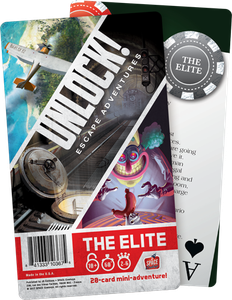 The Elite is a free, twenty-card mini adventure for Unlock!, the card-driven escape room game from Space Cowboys! At the beginning of the adventure, you and your friends find yourself locked in a hotel room with a mystery. You’ll need all of your wits and your logic if you’re going to escape before time runs out. This game is small but well-formed. It flows nicely and showcases the system well, with no particular friction points. The theme is a little bland, perhaps. Still, it’s a good low-commitment option for getting non-escaper friends to try out this sort of game. Just make sure you’ve got something lined up to play afterwards though, because there’s just enough game here to whet your appetite without being enough to really satisfy. In the cartoon-style adventure Unlock! Squeek & Sausage, you need to stop the mad Professor Noside from destroying the world. In your attempt to thwart his plot, the evil genius has caught you in a trap, and you can’t stop him until you’ve found a way out. Can you escape and foil his plot before the clock hits zero? It’s a cute game and if you like your escape rooms with a bit of a hidden object challenge, this will be the game for you. Not for me, mind you, but it could be for you! …the game is slick and fun, and more importantly the system and game come together in a way that just works. In the adventure Unlock! The Formula, The Department has lost contact with one of their chemists, Dr. Hoffman. Your mission is to retrieve the truth serum he had been developing. Deep in the New York subway tunnels, you must seek out his laboratory, locate the doctor, and recover the formula before time runs out. The clock is ticking…can you escape? Adventure games sometimes lead to the frutrating experience where you try each individual inventory object on the other. “The Formula” tries to replicate that feeling, but with penalization. To be fair, it really only happened once, but when you’re given a tool which can work on multiple objects, don’t penalize us for trying! I was again impressed at how much variety they’ve managed to squeeze into the card-based format, and the game combines some knowing nods to common escape room tropes with some refreshingly original ideas. In Unlock! The Island of Doctor Goorse, you and your team have crash-landed on the island of an eccentric antiques collector. Two to six players will be split into teams, separated in the crash, and forced to escape from two separate starting points. 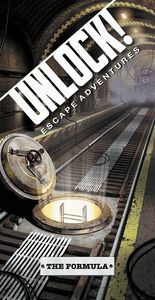 The twists and turns of this challenging adventure will test even the most talented escape artists. With your lines of communication cut, can you and your teammates find a way off the island? I dislike split teams in escape rooms, and I dislike it here. The first 10 minutes my side had nothing to do. We sorted cards, we read the instructions, I trolled anyone that went by. Furthermore, a couple of puzzles were poorly done and soured the experience, especially with the penalizing hint system. Having said that, the game is inexpensive, you can pass it on to friends, and the majority of the game had some clever moments! “The Nautilus’ Traps” brings you to the bottom of the sea. 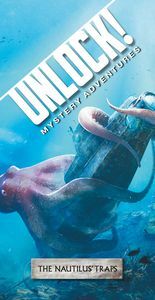 When a sea monster attacks your submarine at the outset of the adventure, it’s up to you to make your way through the depths and back to the surface if you’re going to escape…before your oxygen runs out. “The Tonipal’s Treasure” sets you at the start of a hunt for the treasure of Captain Smith, hidden somewhere on Tonipal Island. 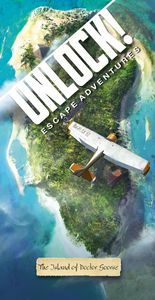 As your adventure begins, you’ve been arrested by the Governor and thrown into prison — you’ll need to escape quickly, especially since Johnson, a famous treasure hunter, is also on his way to Tonipal in search of the very treasure that you seek. These Unlock! games are either free to download, or not available in English. You are locked up in handcuffs, how fast can you break free? In this mission you have to use your spy skills to pick the lock and escape. Make sure to be faster than your friends! You collect most points if you break free the fastest. You are locked up in handcuffs, how fast can you break free? In this mission you have to use your spy skills to pick the lock and escape. I could easily imagine my younger self loving this game. Your mission is to break into the safe. Use your spy skills to scan, solve and crack the code. Safe Breaker is a game that combines skills, memory, and a little bit of luck. Collect the most treasures to win! 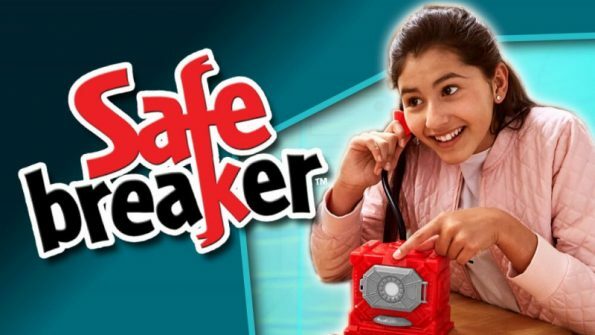 If your child loves the other two installments, then I would absolutely consider Safe Breaker, but I probably wouldn’t pick this one up unless the other games were already a hit in your household. To start the mission, lock the belt on a player and set the timer on the belt. Combine skill, strategy and teamwork to solve a series of challenges and find the master key that unlocks the belt and helps your friend escape. 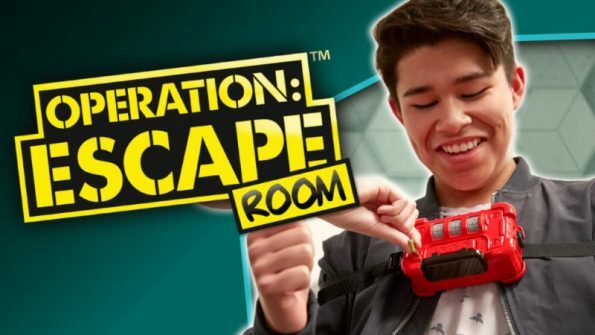 If your kids are too young for escape rooms, but they keep feeling left out when you go to play, Operation: Escape Room could be just what you need to bridge the gap and open them up to a puzzle world that is broader than the jigsaw variety. These games are independently produced and will be mailed to you. Conundrum will provide you and your guests with a unique and memorable party experience. Whether you are hosting a dinner party, social event, theme night, or just getting together with friends; this game will provide the perfect ice breaker. Even strangers will be talking, laughing and puzzle solving like the best of friends in no time. Packed full of fun physical components; no paper-only puzzles. Some legit physical aha’s. Very much handmade from craft store materials. Puzzle flow is open-plan which can lead to confusion (but there are cues, and hints are available). Hardly any plot. Would easily be a top contender except for the price & lack of reset. What it lacked in polish it made up for in love…. It was a quirky box of family-friendly puzzles and school-supplies-turned-oddities. If that sounds like its your jam, then you should buy a copy. Welcome to CypherHouse’s Escape the Arcade, an escape box that gets mailed directly to your door! In this escape room game you will solve a series of puzzles as you attempt to attain the ultimate goal of escaping the arcade. For this game you will need an internet enabled device and a clock or stopwatch to keep track of time. It is also recommended that you have some scratch paper and a pencil if you would like to take notes as you go. Finally, at least one puzzle in this box can be made easier with the use of a straight edge or ruler. But if you don’t have one of these, a paper edge will work fine. A Great White Shark has washed up on the shore of South West England. Its stomach contents contain several documents which lead investigators to suspect there is something strange about this case, can you solve it? If you want to dislike it, there is reason in abundance. And yet, in spite of all the flaws, I surprised myself in enjoying big chunks of this game. Although these were available at one point in time, they are no longer accessible from the website and are presumed discontinued. Mysterious Package – “A package from 100 years ago is delivered to your door. Inside are the clues to an investigation into a government conspiracy from many years ago. Only today in the present can the case be solved, are you up to the challenge? Escape the Crate is a mail order subscription game which ships internationally. Generally costs $30 + shipping. Agents… In preparation for our first crate: Escape the Confederate Spymistress, we need to do some quick recon back to the time of the Civil War. We’ve detected a change to the timeline and we think that it might have some sort of a connection with Abraham Lincoln. We are going to send you back in time to the night of February 2nd, 1861. A train is on route from Pennsylvania to Baltimore, Maryland well after midnight. We know from previous scouting trips that there is very little movement onboard…which will be the perfect cover for your trip back in time. Your mission is to sneak from train car to train car and gather evidence of what the change is to the timeline. Can you discover the clues and get off the train before being discovered? We’ve received word that Abraham Lincoln is about to be assassinated…4 years early. You have only an hour to save the President by breaking into the house of suspected Confederate spy, Rose O’Neal Greenhow. Sift through her belongings, discover her secrets, and crack her code to discover the details of the assassination in time. If you’re willing to forgo aesthetics and beauty in favor of a tabletop escape room with fairly strong puzzles and you like the subscription model, then Escape the Crate is a wonderful choice. It’s smart and family-friendly. We’ve received word that one of our time traveling agents has been captured by Edward Teach… a man you probably know as Blackbeard. We are sending you back in time to the Blockade of Charles Town to recover the agent and escape before Blackbeard notices your presence. You have one hour to break out of the ship’s hold, rescue the agent, sleuth out the identity of an object from the wrong time period on the ship, and escape the ship before you end up in Davy Jones’s Locker. Revenge is sweet…. After being one step behind the sinister Mr. X for missions and missions, the tables have turned. Along with your fellow EMIT agents, you have targeted the location of Mr. X’s secret plans….the vault of a small bank in the heart of the Midwest. You know that if you are to stop his future changes to history, you are going to have to get into that vault and get your hands on those plans. There is one tiny problem though… the bank in question is about to be robbed by a notorious duo…. Bonnie and Clyde. You need to follow the bank robbers to their hideout, find out what they know, and break into the vault of the bank before they catch up. In this cat and mouse game, nothing is sure…. including the ending. There are MULTIPLE endings to this game, leading to a few different ways to replay the game until you perform the perfect heist. Win and you will have all of the plans you need to be one step ahead of Mr. X. Lose and you might just end up next on Bonnie and Clyde’s hitlist. Your time machine has malfunctioned, stranding you back in the prehistoric world….more specifically, the late Cretaceous period. It is a land of jungles and swamps and is one that is inhabited by creatures you never thought you would encounter…dinosaurs. While some dinosaurs are curious of your presence, a few see you as dinner. But the creatures aren’t the only ones that draw your attention. Someone else appears to be back in time too…another time traveler. Search through his or her camp, examine the findings, and discover a way to return to the 21st century. Dawdle, however, and you might end up face to face with a prehistoric predator….or even worse…. in the path of the meteor which destroyed much of the life on Earth. The stakes have never been this high! Good luck! Escapoly is an interactive game for those passionate about escape rooms, thrillers, and logical games. It will be necessary to find clues, solve puzzles, and decipher codes. In this first version, you will be thrown into a crime scene where you will take on the role of a rookie team of cops researching the serial killer called the Enigmist Clown. The game is divided into three missions; each is 60 minutes. Investigate the crime scene, before the killer takes their next victim. iDventure is a German mail order game where you can order the whole package with an option to download and print. It also provides an app to be used with their games. On top of all that, this same app can be used by players to create their own games. With the game “Island of 5 Captains” your guests will travel to the high seas and to the depths of the mysteries related to the discovery of America. 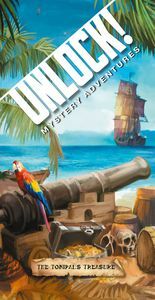 To find the great Inca treasure the players must solve a series of puzzles from the old pirate book. In the game “Unfinished Case of Holmes” the players will be transported to Victorian era London and will go on an unforgettable journey full of challenging riddles and mysteries with the mission to complete an investigation of a mysterious death started but not finished by Sherlock Holmes. 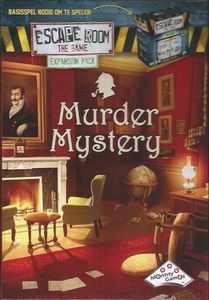 It is a mixture of an interactive computer game and a detective story with real objects pieces of evidence that survived over time. 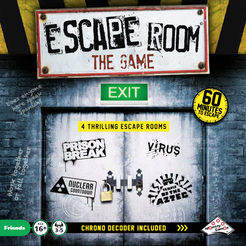 The game is based on an escape room principle where the players need to resolve different types of puzzles in order to proceed to the next level. All materials are downloadable, however, the person preparing the game will get no spoilers – no indication for solutions can be discovered unless you start playing! The Divas were given a review BETA copy of this game. You can order the whole package to be mailed to you, or receive a download DIY version. We got the downloaded version and it took a bit of time to set up with a lot of printing, so if you choose this option, be aware there is some cutting and gluing! 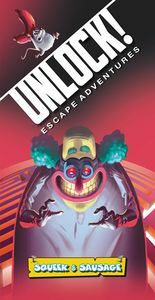 The game itself has wonderful art all consistent with the theme, and the puzzles are very challenging, focusing more on those who are enthusiasts as opposed to newcomers to the escape room genre of board games. The “interactive computer game” aspect is a downloadable app which is used to check answers. It is easy to use and integral to the story as well, as it advances the plot. Although the beta version of the some of the puzzles had to be tweaked, we enjoyed ourselves and the developer was very open to suggestions we had to improve the game play. The full game will be a worthy addition to your escape room take home collection. The purpose of this game is to find the name of magic potion that will help Alice grow to her normal size and get back home. In order to figure out the name the players must search 6 pieces of a scroll that are hidden in different places in Wonderland. The players meet the inhabitants of Wonderland and solve numerous challenging tasks. Instead of waiting for games to be sent to you, these can be printed at home. 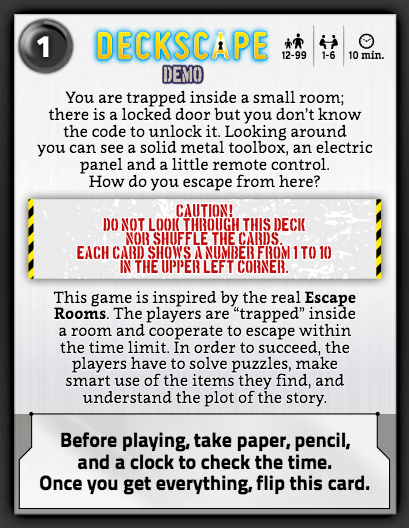 A digital-physical escape game using their app. Each mission is around 20-30 minutes. This mission tests your team-play abilities. Work cooperatively, let others know what you‘re thinking, stay calm – and you won’t have any problems with this bomb. A hasty mission that makes it necessary to work together and to stay concentrated, despite all pressure. Don‘t get distracted and carefully work your way towards the solution. This mission is highly demanding and requires di erent skill sets. Hopefully, you have good team to handle this one. Don‘t give up – together, you can surely do it. An action-laden mission that requires sharp thinking, quickness and clever teamwork. Try everything to solve the riddles of the maniac before the innocent passengers are harmed! “A Sweet Tooth Mystery” is a preplanned escape room designed for any age who is ready for a challenge! An Escape Room is a fun activity where a group of people are locked in a room and have to race against the clock using critical thinking and problem solving skills to escape before the time runs out. Family-friendly games for you and yours. Both print and play, as well as materials being mailed to you. Step into the shoes of hot-shot news reporters racing to solve a maze of clues and puzzles in order to earn an exclusive interview with a notorious mad-man! Only the winning team will land the story, so brush up on your favorite board games if you hope to win. Designer Elliott Bailey has created DIY escape kits for you to download and print at home. All kits around $20. Make your next kids party an escape room adventure! This game kit has everything you need. Transform your next kids birthday party into a mysterious Egyptian adventure. Great for large groups. In this treasonous escape kit your crew must take down the Governments W.A.R. Facility before it goes online. …for simple play-at-home escaping, you probably want to try one of the other commercially available games first; but if you’ve run out of those, or if you want a game right away and can’t wait for postage delivery, then this will provide a good 40-50 minutes of light entertainment. A humorous zombie themed escape room kit that transforms your home into an Arggh-venture! Can your crew of coders hack into an evil programmer’s computer and stop their virus before it’s too late? Find out in this DIY kids escape room party kit. Works well for 4-12 people. Based around the classic poem ‘A Visit from St. Nicholas’, the game will send your family or friends on a hunt around the house to discover the final location, making sure they’ve earned their presents from you! We’ve made sure to make this only a little challenging, so as to not tax people too much on Christmas Day! However, children may need a little help from an adult to solve some of the codes and puzzles on the cards, making it ideal family fun. This is an online little puzzle mystery. By all means, if you know of any other escape room board games, or other reviews I have not included here, please contact me! Super great list Errol and thanks for the mention (Heist Party). I’m going through all the escape board games I can find and you’ve listed some here I hadn’t found yet – super thanks. Awesome! And I will update this list so if you know of any others, please do tell! Thank you very much for the shout out to The Game Room. We have been getting great feedback over the course of the Kickstarter campaign and have made tweaks to the game which we are really excited about. What really sets ours apart is the live-action option…you can play at the table or set up a real escape room at home. I wanted to include a great review we got from Dale at Opinionated Gamers…he managed to sum-up The Game Room better than we did ourselves! 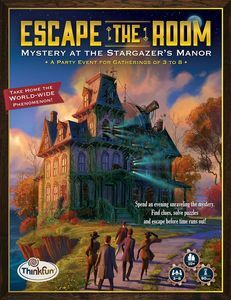 “I can say that our group has had a great time with it, and would recommend it to others wanted a puzzle hunt/escape room experience at home.” – Dale https://opinionatedgamers.com/2016/09/24/dale-yu-preview-of-the-game-room-part-2-mr-boddy-spoiler-free/ Thanks again, Errol! Oooh! No problem! I tried your game as well and we did have fun! Good luck on your kickstarter! Thanks for the list. We’ve played a few of the games and look forward to the others when they’re available. Very informative and thorough. Thank you again. I haven’t played it, but this probably belongs on this list. It looks neat. Yes! I need to add this. We DID play this and enjoyed it. there have been quite a few on Kickstarter. I believe the list needs to be updated with Unlock! 3, Deckscape 3, and a few more games 🙂 Looking forward to it! There’s a hand-crafted game on ‘Bonanza’ and/or ‘Ebay’ called Mystery at Oak Island that uses boxes and 7 real locks. Expensive compared to other games but does include actual locks. Arca Ludum is a new escape room board game project. It has two different games now. You can look at the website.